The LCG115 is a laser diode module with a built-in cross-generating optical assembly. It projects two intersecting laser lines that can be used to align or target objects and surfaces in industrial environments. The angle between the lines may be adjusted to any value between 0° and 90°. In this way, you can generate a right-angled cross even when the laser is not mounted at 90° to the target surface. Wavelengths of 520nm (green) and 635nm (red) are available with powers up to 5mW. The 1mW red LCG115 is a Class 2 laser, widely accepted as safe under all conditions. Additionally, the green LCG115 emits light that appears more than 2X brighter to the human eye than the equivalent power in 635nm. As a result, you’re more likely to see these projections against dark materials, in high ambient light levels, or from long distances. 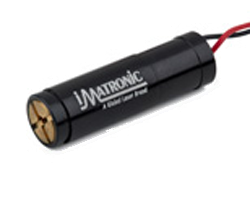 An optional TTL modulation input is available allowing you to drive your laser using a digital voltage signal. You can then change the mark-to-space ratio to control the mean intensity of the output beam, modulate the laser with coded information, or synchronise the laser with an external measurement device such as a photodetector or camera.